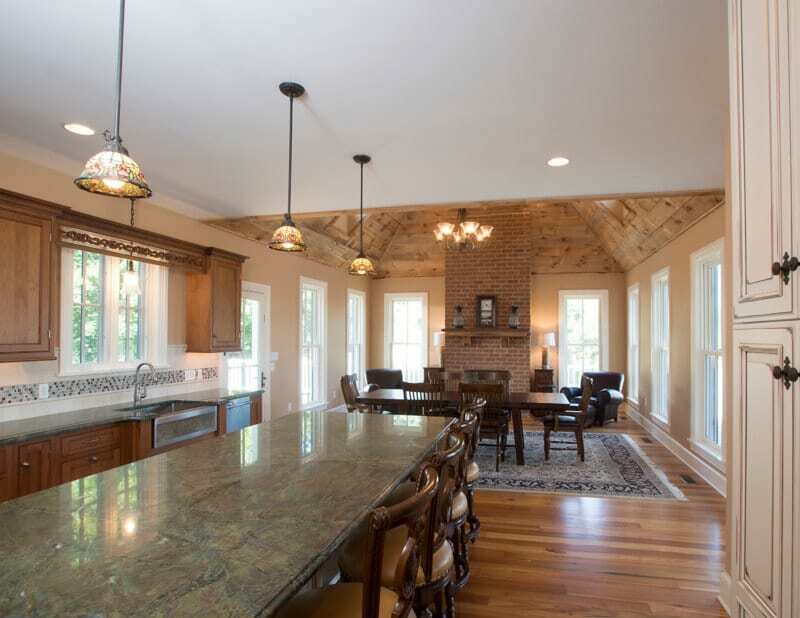 In a recent competition sponsored by the Maryland Improvement Contractors Association and Chesapeake Home + Living Magazine, American Contracting won the 2014 Remodeler of the Year award for Residential Addition. Our customer and his family live in a community north of Baltimore. Their kitchen was outdated and too small to accommodate each family member and their specific needs. A new larger space was required to allow for dining in a more casual atmosphere while also providing entertainment space. There was room to the rear of the house to provide for a kitchen addition that incorporated the existing porch while expanding outdoor space by adding a larger rear deck and accessible entry ramp. Together with the family, architect Peter Twohy, and the owners of American Contracting, a design was created that affords ease of accessibility while incorporating the style of the home and the entertaining space that is so important to the family. A large fireplace was centered to the room. Space for a larger casual dining table provides more than enough seating for family and guests to the home. A large island provides combined preparation space with a serving platform for parties. It also has seating under the counter. A special alcove was created specifically designed for a family heirloom cabinet. A vaulted ceiling was created that incorporated reclaimed wood that had been stored on the property giving the entire space a dramatic but casual feel to the room. Custome and semi-custom cabinets were provided by Rojahn Kitchen Cabinets.